The lovely village of Monteroni d'Arbia, has an ancient mill, castles, restaurants, shops, and is ideally situated in the ehart of Tuscany between Siena and Montalcino." These historic buildings are surrounded by 1800 acres of wheat fields, sunflowers, vineyards, corn, oak woods, lakes and the Arbia and Biena streams. The Podernovo farmhouse is the oldest of the San Fabiano estate, dating back to 1650. Beutifully restored, it has all modern conveniences. 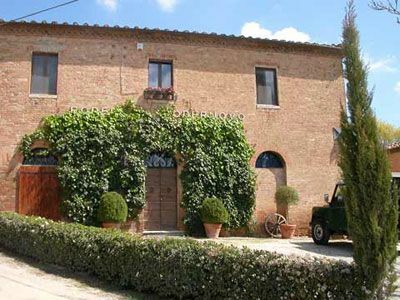 Agriturismo San Fabiano is in the tuscan countryside, only 12 km south of Siena. In Monteroni d'Arbia there are all kind of shops. Nearby there are also some restaurants. Monteroni d'Arbia, 300 metres from the farmhouse. High Season: 23/Mar-02/Apr; 01/Jun-31/Aug; 22/Dec-08/Jan/14. Mid Season: 01/Mar-22/Mar; 03/Apr-31/May; 01/Sep-21/Dec. The farmhouse is closed from the 9th of January to the 28th of February.